1. Peel the carrot and slice it up. Soak Black fungi ahead of time, rinse and tear into pieces or remain the whole. 2. Rinse the celery, get rid of the fibre and cut into strips. 3. 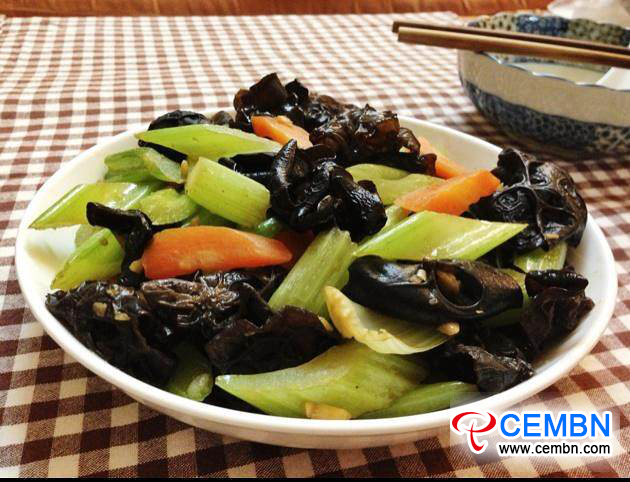 Go blanching of carrot slices, celery strips for 1 minute, Black fungus pieces for 30s, remove with a slotted spoon and set aside for use. 4. In a wok, heat the oil, once hot, drop in minced garlic and stir till fragrant, then add carrot slices, celery strips and stir-fry over high flame for 3 minutes or so. Then combine with Black fungus pieces, pour in half bowl of water and maintain the heat for another 3-5 minutes till evaporated. 5. Season with light soy sauce and a pinch of salt. Serve and enjoy.